In order to run any Activity monitoring you must first enable data collection on the Virtual Machine(s). 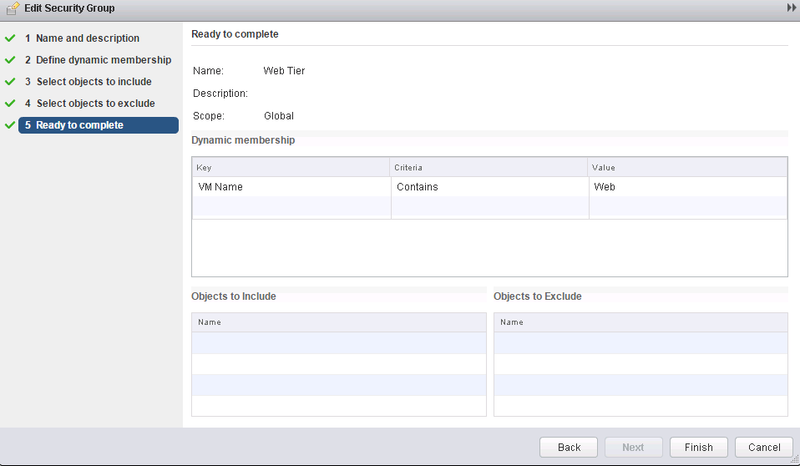 Also, another prerequisite is that vShield Endpoint must be installed, or a domain must be registered with NSX Manager. You can either enable Data collection on a single VM, or multiple VMs, but the process is different between the two. Once that is complete, you should wait at least 5 minutes before running the report or there may not be any data. Step 1. 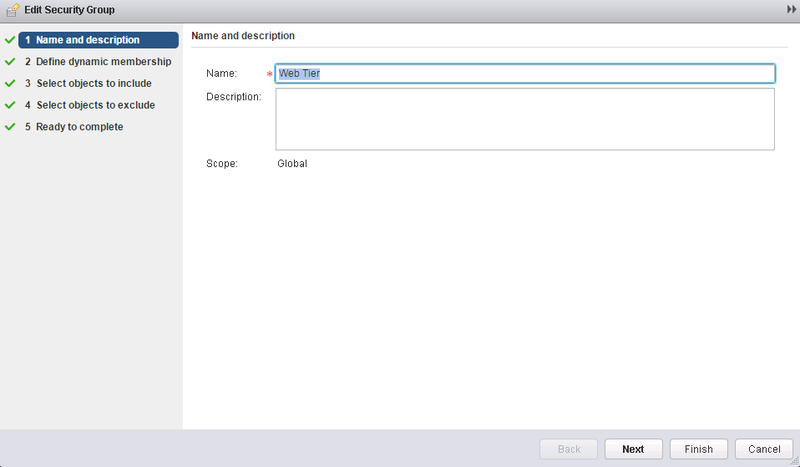 To enable Data collection on a single Virtual Machine navigate to the VM -> Manage -> Settings -> NSX Activity Monitor then click Edit to enable. Step 3. Specify Membership criteria. This is where you get to be really creative, and specify members by Computer OS Name, Computer Name, VM Name, Security Tag, or Entity. I wanted both of my Web Servers included, so I used VM Name contains “Web”. You can add multiple membership Criterias, or just use one. Step 7. Finally, depending on your criteria, you can confirm how many Security Policies, Guest Introspection Services, Firewall Rules, Network Introspection Services, Virtual Machines are part of the Security Group. In my instance, two Virtual Machines matched my criteria. Outbound: View what applications are run by a server pool, or security group and what client applications are making these outbound connections. You can also find all groups and users who are accessing a specific application. Inter Container Interaction: Traffic between two containers you have defined. These containers can include server pools, security groups, or even AD groups. 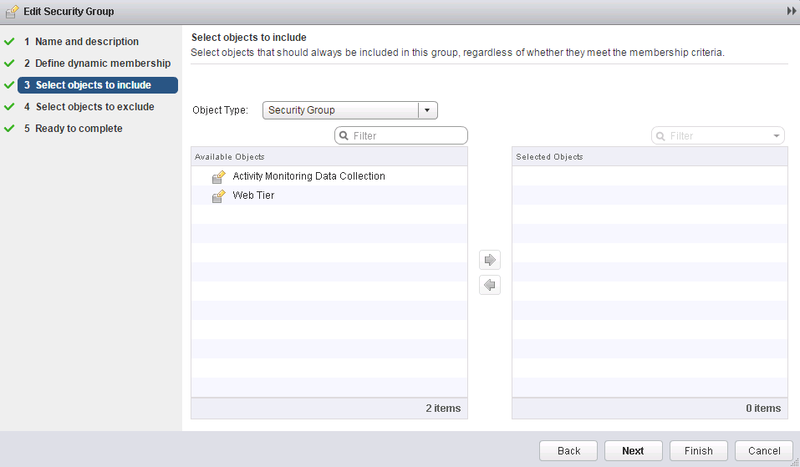 For more information, please see VMware Documentation on Activity Monitoring. please advise as per vmware Documentation , Activity Monitoring. security group already defined so no need to add new security group ?? Yes, Activity Monitoring already has a default security group. 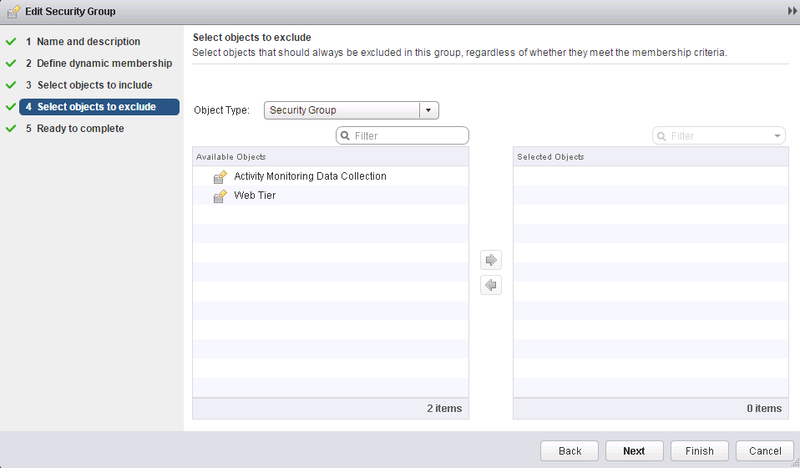 i think source VMand destination VM you must enable data collection in both ?? You don’t have to, depending on what you are trying to do. What are you trying to accomplish, data security between two VMs? Then yes.. In my environment i don’t have vShield Endpoint. So in this case if i need to use Activity monitoring, is it sufficient if i can integrate my NSX Manager with my active directory. At present my NSX Manager is not integrated with Domain (Active Directory) & i am not able to enable data collection on any of my VM. Further to the above question will the Guest Introspection will work for only guest VM with Windows. One more question. Can the activity monitoring be enabled continuously or it can be enabled only on need basis. Is it for continuous monitoring or can be used only whenever we require the monitoring data.